But it wouldn't be a Spearhead show if Franti didn't speak out about whatever was on his mind and, likewise, he came through on that front with a talk about the situation along the Gulf Coast. 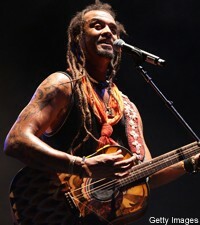 But the talk wasn't what you'd expect from Franti, who is a front-line activist for all things good and heady. There were no "Protest BP!" rallying cries or critiques over how the situation was being handled by the powers that be. Instead, Franti kept it positive. "We got a chance to play on the Gulf Shores recently," he said, referring to last month's Hangout Music Festival in Alabama. "It was my first time playing there and it was beautiful." And although that coastline is now another victim of the oil spill, Franti said that he just didn't know what to do about it, until he talked to a local who told him, "I want you to tell people how beautiful the beaches in Alabama are." So he told that to tens of thousands of Bonnaroo fans. The oil cleanup will eventually be complete -- hopefully sooner than later -- and when it does, tourism should return to the area. "Bring some friends, drink some beer," said Franti, who then cut into his appropriate, 'Everyone Deserves Music.' Halfway through, he ad-libbed a new lyric: "The plants and the birds and the fish in the sea, they all deserve music!" Amen.